BANGI, 28 April 2014 – Students and staff of The National University of Malaysia (UKM) had recently undertaken various activities for the people of Mambakut in Sabah under its Community Outreach Programme. Various activities were held including educational workshops and sporting sessions to help improve the wellbeing of the people there. The four day programme began on April 17 with the cooperation of the Kimanis Parliamentary Service Centre, University Malaysia Sabah (UMS) and the Ministry of Education. The programme was held under the Membakut Visison to bring development to the region with the theme Developing Membakut Through Education launched nearly 10 years ago. However progress had been slow and had now been given a new lease of life to get everyone of the community to be involved. Membakut Assemblyman Datuk Haji Mohd Arifin Mohd Arif closing the programme on behalf of the Member of Parliament for Kimanis Datuk Sri Anifah Haji Aman said involvement of institutions of higher learning is essential to ensure its success. The Membakut Vision is a programme aimed at developing not just the physical but the overall well being of all members of the community including culture and art forms. It is especially aimed at the youths to encourage them to pursue their education right to the top to enable them to enter various professions and business. Membakut is rich in natural resources with beautiful beaches and rich marine life with high potential to be developed for eco tourism activities. 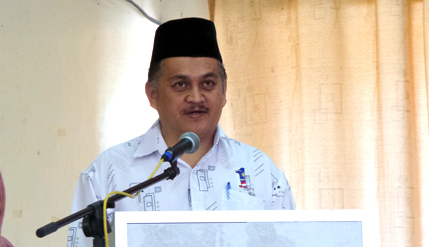 Datuk Ariffin said that UMS had recently discovered that Membakut has rich soil that is most suitable to be used in a high quality ceramic products industry. Present at the closing ceremony were the Vice Chancellor of UMS, Prof Datuk Dr Harun Abdullah, Haji Musa Zainal Abidin Othman representing the UKM Vice Chancellor and the Assistant District Officer Membakut Haji Sanudin Haji Ismail.